Where would Americans most like to live — and how do they feel about the place they currently call home? A new national survey by the Pew Research Center’s Social & Demographic Trends project finds that nearly half (46%) of the public would rather live in a different type of community from the one they’re living in now — a sentiment that is most prevalent among city dwellers. When asked about specific metropolitan areas where they would like to live, respondents rank Denver, San Diego and Seattle at the top of a list of 30 cities, and Detroit, Cleveland and Cincinnati at the bottom. Even though the survey shows that many Americans have a bit of wanderlust, it also finds that most are satisfied with where they live now. More than eight-in-ten rate their current communities as excellent, very good or good. People who have moved at least once (63%) and those who have lived in the same place all their lives (37%) are equally content with their current home. These findings emerge from a wide-ranging telephone survey of a nationally representative sample of 2,260 adults, conducted Oct. 3-19, 2008. An earlier report, based on other questions from the same survey, found that nearly one-in-four adults (23%) say the place in their heart they consider home isn’t where they are living now. That report also cited Census Bureau data indicating that Americans are changing residences less often than they used to: Only 11.9% moved between 2007 and 2008, the lowest share since the government began tracking this measure in the late 1940s. This latest report explores a range of attitudes related to where Americans live, where they would like to live and why. It finds that most city dwellers think the grass would be greener in a suburb, small town or rural area. But urbanites aren’t alone in feeling mismatched with their surroundings. More than four-in-ten residents of suburbs, small towns and rural areas also report they would prefer to live in a different type of community. Who We Are Shapes Where We Want to Live? Some notable demographic and ideological patterns emerge in the survey responses. For example, most young urbanites consider cities the place to be, while most middle-aged urbanites would like to live elsewhere. Seven-in-ten rural men are content where they are, compared with just half of rural women. Most rural conservatives feel right at home; most urban conservatives don’t. But urban liberals do. Demographics and political views also help shape people’s taste for specific cities. Many more young adults than older adults are drawn to New York and Los Angeles. More men than women want to live in Las Vegas. Well-to-do adults are twice as likely as the less affluent to want to live in Boston. Republicans think Phoenix would be a great place to call home. Democrats feel the same way about San Francisco. Geography matters, too. Seven of the public’s 10 most popular big cities — Denver, San Diego, Seattle, San Francisco, Phoenix, Portland and Sacramento — are in the West, and the other three — Orlando, Tampa and San Antonio — are in the South. The five least popular big cities — Detroit, Cleveland, Cincinnati, Kansas City and Minneapolis — are all in the Midwest. These attitudes reflect what government data indicate about the nation’s migration patterns: Americans are leaving the Northeast and the Midwest in favor of the South and the West. Americans are all over the map in their views about their ideal community type: 30% say they would most like to live in a small town, 25% in a suburb, 23% in a city and 21% in a rural area. By a ratio of more than three-to-one, Americans prefer living where the pace of life is slow, not fast. A similarly lopsided majority prefer a place where neighbors know each other well to one where neighbors don’t generally know each other’s business. By about two-to-one, they prefer to live in a hot-weather place over a cold-weather place. On the food-and-drink front, a slight plurality would rather live in a place with more McDonald’s (43%) than one with more Starbucks (35%). About seven-in-ten whites rate their current community as “excellent” or “very good”; only about half of Hispanics and four-in-ten blacks say the same. 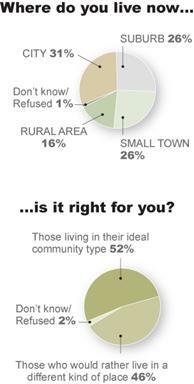 Rural and suburban residents rate their communities better than do residents of cities and small towns. People who live in a city — as well as people who want to live in a city — are more open than others to the idea of living with neighbors who are of different races. They are also more open to living among immigrants. When it comes to community involvement, there is no difference among those who live in cities, suburbs, small towns or rural areas. About half of the residents in each place say they are involved, and half say they aren’t.